"Nellie seemed a little nervous because she was in the first session on Saturday morning, and like They Might Be Giants last year, wasn't used to that time of day. The audience seemed tentative in its response to her humor ­ probably a combination of time of day and not having an preconception that she was a humorist. I think she felt she was flopping, but after figuring her out, the audience warmed up, and she ended up with a TED standing ovation. 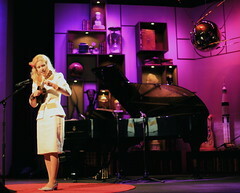 She came back (on uke) with Thomas Dolby's house band and Kaki King for a finale of 'We'll Meet Again'."